We've presented over 200 artists at Clear Creek over the last decade, including individual artists and numerous ensembles across multiple genres. We focus on presenting socially conscious artists from near and far as well as providing opportunities for local artists to share and extend their work. The Way at Midnight explores confrontations with losing and being lost from the colonial period through the digital age and incorporates theatrical performance, visual installation and live and recorded music. Directed by Joanna Russo, Mondo Bizarro’s latest work is inspired by contemporary questions of migration and (dis)orientation. This performance is presented at Clear Creek as part of the Solstice Spectacle from June 22-24, 2018 and is one in a series of works shared at Clear Creek by Mondo Bizarro through a multi-year regional artistic exchange. The touring performance of The Way at Midnight on Clear Creek is supported by the National Performance Network. Following Dante and Virgil through the seven stages of Purgatory, The Wastelands explores the seven stages of grief in a time of violent political and environmental unraveling. 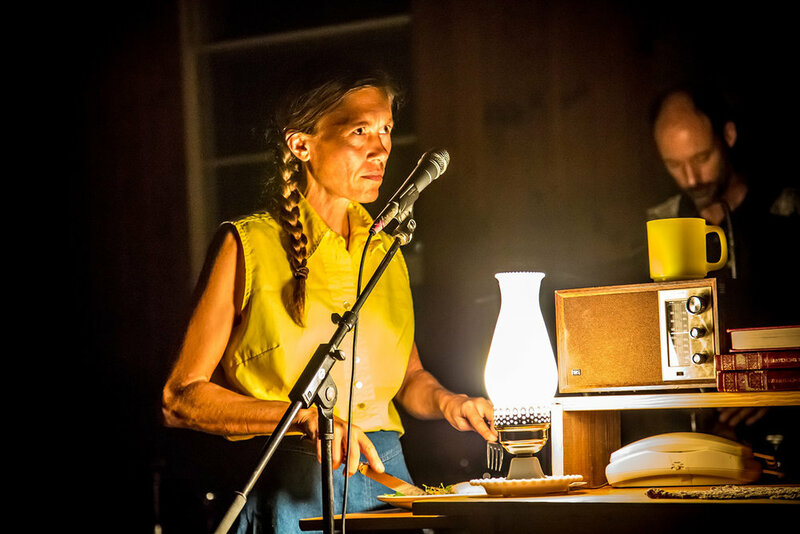 Guided by visual, musical, and kinesthetic poetry, The Wastelands travels through places in a process of rewilding and is led by a full, original operatic score composed and arranged by Walken Schweigert (a 2017 Clear Creek artist-in-residence). The Wastelands has been invited to Clear Creek as a continuation of our multi-year, cross-cultural artistic exchange exploring transition and resilience in our cultures, economies and environments. This touring performance and artistic exchange between Open Flame Theater and Clear Creek Creative is supported by the Network of Ensemble Theaters. ALLEGED LESBIAN ACTIVITIES is a denim-clad, glitter-crusted, power-ballad performance of oral histories from the New Orleans lesbian community. Last Call has been invited to Kentucky by Clear Creek Creative for a site visit and learning exchange in advance of touring Alleged Lesbian Activities. As part of the artistic exchange planned for 2018, Last Call plans to conduct oral histories and workshops that explore the history of dyke bars and queer culture in Kentucky. Another vantage on transition and resilience in our cultures, economies and environments. This exchange between Last Call and Clear Creek has been supported by the National Performance Network. Clear Creek Creative presented the national touring premier of Cry You One, an outdoor performance that journeys into the heart of the disappearing wetlands of the Gulf Coast. Part song, part story, part procession for our lost land, Cry You One celebrates the people and cultures of South Louisiana while turning clear eyes on the crisis of the vanishing coast. The 2014 production of Cry You One at Clear Creek involved 18 artists and crew in residency on site over a three-week period and a cultural exchange with dozens of local artists and community members. The performance was initially workshopped for the site-specific performance in 2013 during the Clear Creek Festival. Supported by Alternate ROOTS, Art Spot Productions, Chorus Foundation, Clear Creek Creative, Mondo Bizarro, New England Foundation for the Arts, Network of Ensemble Theatres and South Arts. All photos by Melisa Cardona. Selections from their original performance Between a Ballad and the Blues were offered by Carpetbag Theater (Knoxville, TN) during the 2013 Clear Creek Festival. Between a Ballad and the Blues was written by Carpetbag Theater founder Linda Parris-Bailey. The performance chronicles the life and work of African-American Appalachian renaissance man Howard "Louie Bluie" Armstrong and his musical partners. Together they formed one of the most famous string-band groups in the history of American music who toured the globe sharing string band music with the world, planting the seed for other American music forms, including Country and Blues. The full play spans a seven decade musical career and was excerpted for a profile performance at Clear Creek. Runnin’ Down the Mountain was presented in its extended "House Party" format during the 2013 Clear Creek Festival as another installment in Clear Creek's multi-year cultural exchange between artists and cultural works of Appalachia and the Gulf Coast exploring themes of transition and resilience. The New Noise performance mixes original and traditional music, live looping and soundscapes with visual storytelling to ask why we hand down what we do and why we’re raised to leave. Crankies are illustrated, hand-cranked scrolls depicting songs and stories as they are performed. Through their immersive creative process, Anna & Elizabeth pioneer new ways of understanding old songs and stories and marry the spartan simplicity of two voices in harmony with acoustic instruments, percussion, synth, pump organ, film projections, choreography, and, of course, their crankies. We presented Crankies at the 2012 Clear Creek Festival as an exploration of the transition and resilience of culture and stories represented in their modern interpretations of traditional Appalachian songs and stories. Clear Creek has been honored to host 3 of the 60 UPRISINGs in the five-year series of monthly, site-specific performance works by Nicole Garneau. UPRISING performances broadly explore practices of revolution by creating public demonstrations of the possibilities for a more loving, just and humane present and future. They are attempts at making the world in which we want to live and then inviting people directly and immediately inside it. UPRISINGs were presented at Clear Creek in each 2010 (UPRISING #33), 2011 (UPRISING #45) and 2012 (UPRISING #57) and Nicole has been a quasi-permanent artist in residence at Clear Creek or nearby ever since. Her book Performing Revolutionary: Art, Action, Activism, which details the UPRISING experience -- and invites others into this revolutionary work -- has been partially manifested here on the Creek. Race Peace was born in the aftermath of Hurricanes Katrina and Rita as a group of artists and friends with long-standing relationships struggled to address the blatant issues of race at the center of the storm. Artists from Mondo Bizarro and M.U.G.A.B.E.E. joined us at Clear Creek in 2011 to offer a workshop and performance in which participants were offered the opportunity to craft a shared understanding of the complexities of racism, both individual and institutional, and envision ways of moving forward together. Race Peace offers a space where people from diverse backgrounds can safely and aggressively challenge the realities and myths of racism in America, in addition to considering how art can engage people in noteworthy dialogue about challenging social issues. Loup Garou was the first of a series of performances invited to Clear Creek as part of an ongoing cultural exchange between artists from the Gulf Coast and Appalachia exploring issues of loss and resilience, extraction and transition in relation to culture, economy and environment. 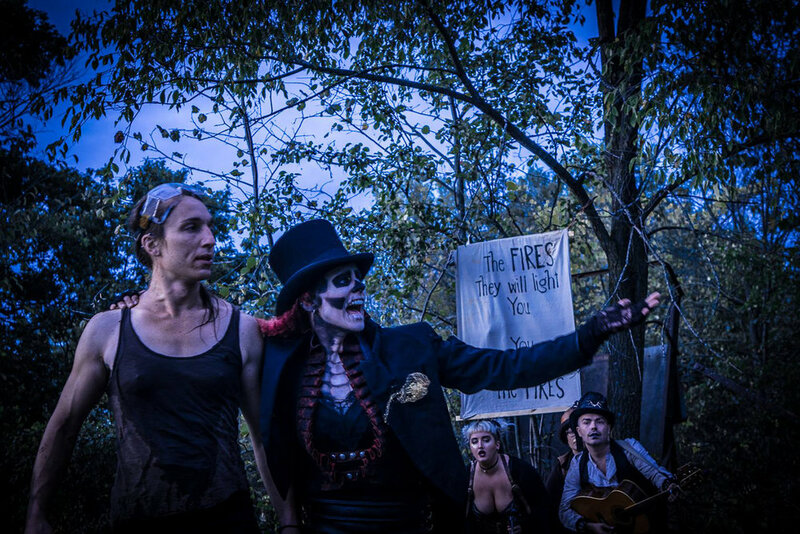 Produced by ArtSpot Productions and Mondo Bizarro, in collaboration with the Gulf Restoration Network, Loup Garou is part performance, part ritual, part howl to the world about southeast Louisiana’s plight. Performer Nick Slie and writer Raymond Moose Jackson each shared elements of the piece at Clear Creek in 2011 along with a visual installation by Melisa Cardona. Presented at Clear Creek and you're not listed here? Let us know via the contact form linked below and remind us of your art form, the place to locate you in and a current link if you'd like folks to find their way to you from here.